Coffee w/ Chris: Does your law firm have enough air in its tires? Today's video starts off with an overview of a recent precedential decision of the U.S. Court of Appeals for Veterans Claims in the case of Moody v. Wilkie, Cause No. 16-1707. Click here to read the CAVC's panel decision in Moody v. Wilkie. The opinion for the Court is written by Judge Schoelen, who is joined by Judge Pietsch and Judge Toth on the precedential aspect of the decision. You can click here to see the whole Veterans Court docket in Moody, and read the parties' briefs. The case was briefed for the veteran by attorney Todd Wesche. On the briefs for the government was attorney Ashley D. Varga. Judge Toth, while he concurs in the precedential aspect of the decision, dissents on an issue related to the remand of a particular claim to the BVA. 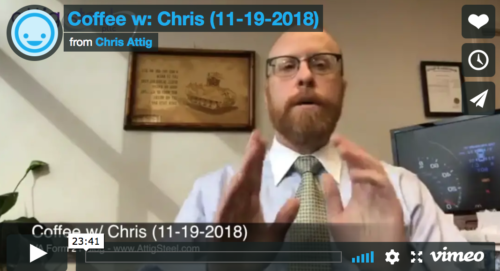 He uses a very memorable metaphor to describe the Court's standards of review, and in today's "Coffee with Chris," I will speculate what Judge Toth's description about the standards of review might tell us about his judicial philosophy. After that, we move into the heart of our discussion. Just like the dashboard of a car, every law firm should have certain measurements that it looks at every month, quarter and year. Over the past few episodes of "Coffee w/Chris," we have been discussing the critical law firm metrics - or law firm KPIs (key performance indicators) that should be on every law firm's dashboard. One law firm metric we talked about the law firm's "fuel gauge," and how you know if your law firm is about to run out of fuel. We discussed the law firm metric that most closely approximates the law firm's "tachometer," so you know when your law firm is running "in the red" or about to "stall out." In this episode of "Coffee w/Chris," I'm going to talk to you about another law firm metric that should be on your firm's dashboard, because it helps you anticipate when your law firm is running flat and needs air in its tires.